Wondering which gardens to visit on your day trips around Cornwall? Cornwall is home to many of Britain’s most beautiful gardens and several are just a short drive from our luxury hotel in Fowey, making it a great place to base yourself for a few days. The mysterious gardens and estate offer over 200 acres for exploration. Discover romantic Victorian Productive Gardens and Pleasure Grounds along winding paths laid out over two centuries ago. Venture into a sub-tropical outdoor jungle and explore ancient woodlands managed to promote wildlife, which is celebrated at a pioneering Wildlife Project. The Lost Gardens of Heligan are a scenic 30 min drive from Fowey, so after a morning exploring, you can be back to the hotel in time for cream tea on terrace. One of the most famous gardens in the country, The Eden Project was named Best UK Leisure Attraction at the 2011 travel industry Oscars. The Rainforest Biome takes you on a journey through the rainforests of Malaysia, West Africa and South America, while the Mediterranean Biome takes you across the equator to South Africa and onto experience the Californian landscape. The Eden Project has also emerged as a top music venue hosting a range of renowned artists and bands including Primal Scream, Jack Johnson and Paolo Nutini. Lanhydrock House and Gardens is one of the most beautiful National Trust properties in Cornwall. Set within 1,000 acres of wooded parkland and landscaped gardens, this late Victorian country house was home to the Agar-Robartes family, who made Lanhydrock their home in 1620. As you explore the 50 rooms, discover how the family’s fortunes changed during the First World War and be sure to try your hands at playing the Steinway piano in the Long Gallery. Tregothnan is believed to be the first place to grow ornamental Camellias outdoors in Britain almost 200 years ago. They produced the first teas actually grown in the UK and are still to this day, the only producer growing tea in Britain. 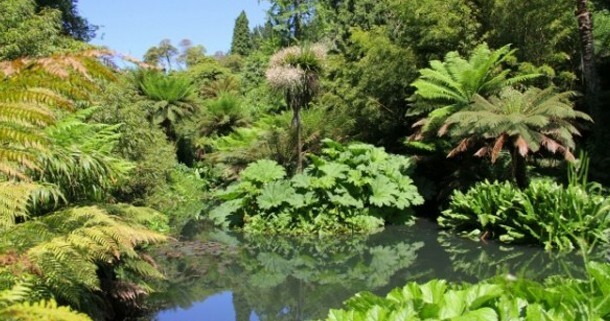 Tregothnan is also home to the largest private botanical gardens in Cornwall. The private estate and gardens open its doors for exclusive garden visits. Better yet, you’re guaranteed a great cup of tea afterwards! The 120 acre woodland gardens at Caerhays Castle are English Heritage listed Grade II. The gardens are home to a National Magnolia Collection, a historically important collection of Chinese plants that can be traced back to the work of the great plant hunters Ernest Wilson and George Forrest. The gardens open to the public from February to June, when there are many routed walks to explore. With spots like Noah’s Ark, Donkey Shoe and Mr Roger’s Quarry on the map, it’s sure to be an intriguing visit. There is a vast choice of gardens to visit in Cornwall. All lie within a leisurely drive of the picturesque Cornish town of Fowey. Just 20 minutes from the world renowned Eden Project, you’re never far away from the action in this vibrant bolthole. The Old Quay House Hotel, a small boutique hotel in Cornwall is the place to stay. A long drink on the waterfront terrace overlooking the estuary is the perfect ending to a perfect day – and another thing to tick off your ‘things to do in Cornwall’ list.